I don’t remember exactly how long ago I found this chair and I’m pretty sure it wasn’t in quite this bad condition, but from the start, the plan was to rework the chair. I found it at an antique market and paid next to nothing for it. It had lovely lines and I knew instinctively the best way to attain the look that I wanted at the price I was willing to pay was by transforming a vintage French chair. It sat in a corner of my den for way longer than I ever intended, with a soft throw covering the offending bits. But the chair was by the window and my dog loved to perch himself on it to look outside, and while he was there, he would pull at the innards until it really was in shreds. The thing was, I couldn’t decide what fabric I wanted to cover it with since I wasn’t sure where I wanted to keep it. As with many things like that, I managed to ignore it despite the fact that it was the only thing in the room that wasn’t finished. When we moved into our new house a few months back, I finally decided it was time to address the chair. 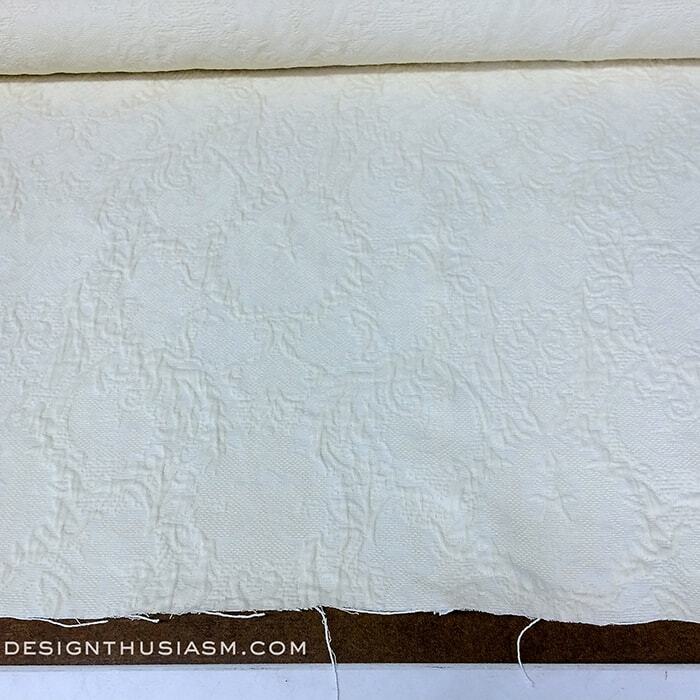 I decided to go neutral for maximum flexibility and chose a tonal jacquard from Ralph Lauren. Then I packed up my sad looking chair and took it to a local re-upholsterer. When I dropped it off by his ‘seen-better-days’ garage, it looked like that was exactly where it belonged. So imagine my delight when I picked up my chair! I had worried that the light fabric might not work with the dark wood, and then worried more than it wasn’t light enough. In the end it was exactly what I was hoping for. I considered painting the dark wood a lighter tone (and may yet still do that in the future), but the chair was going into a bedroom that my son uses when he stays with us and the dark wood helped keep it looking a little less feminine. 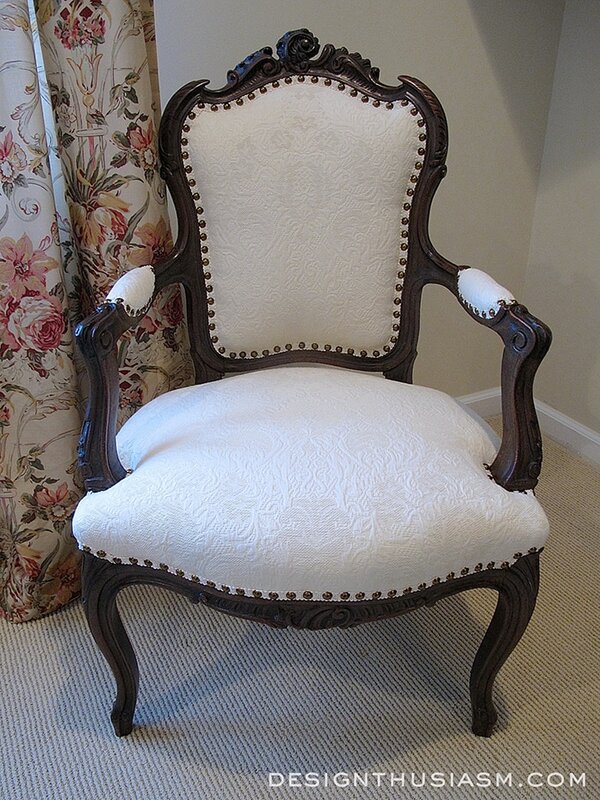 The chair has really beautiful detail with curves and carvings and nailhead trim. The lines would work wonderfully with an antiqued paint treatment, but I plan to live with it a while before making that decision. The wall hangings in this room add interest to it and are a bit more complex than a simple piece of art. 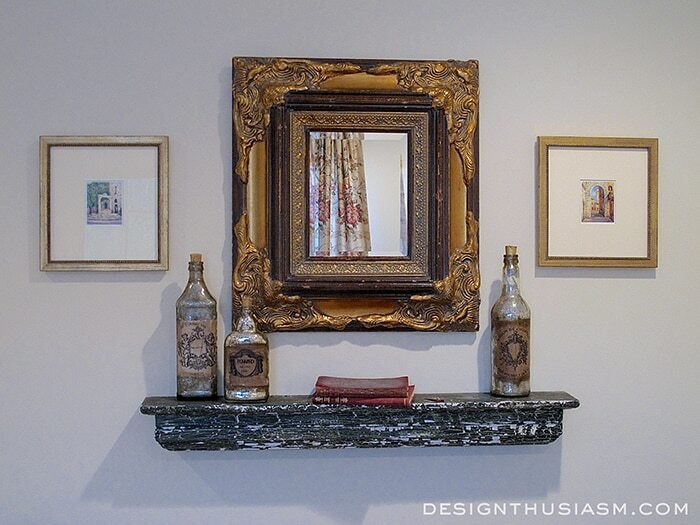 I went with a chippy painted shelf beneath a small bold mirror with mercury glass bottles featuring distressed labeling. My intention to go neutral kept in mind the patterns that could be added to merge the chair into the decor of the room. 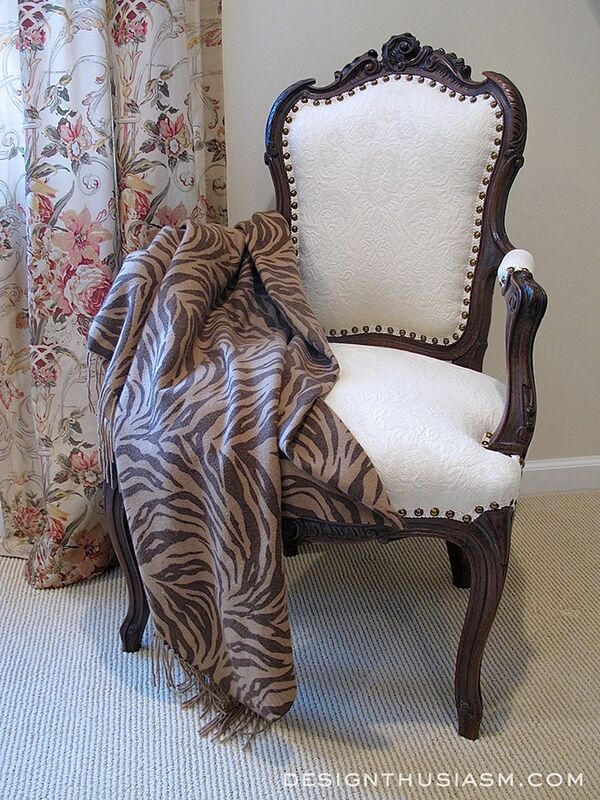 Here I’ve draped a skin print throw with an uber-soft feel, but it could also be done with a tweed pillow. 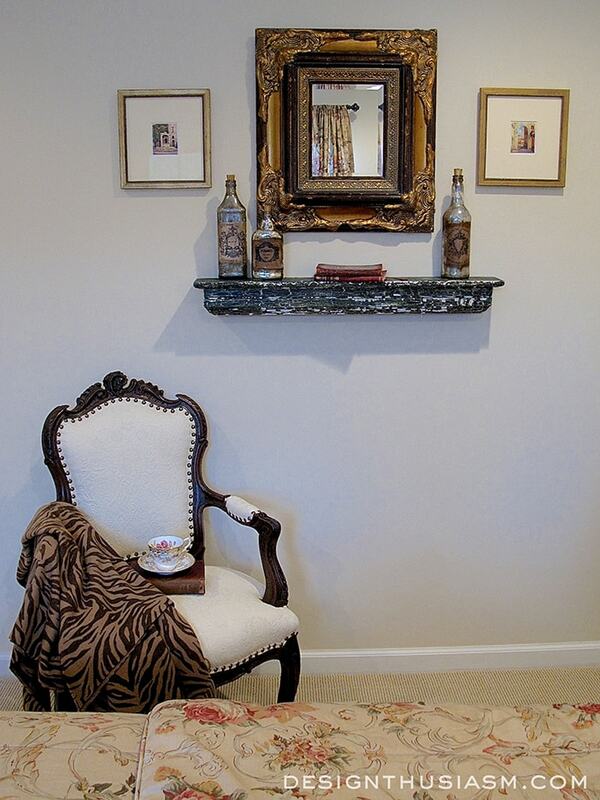 The room revolves around a khaki palette and includes pieces with an aged look. 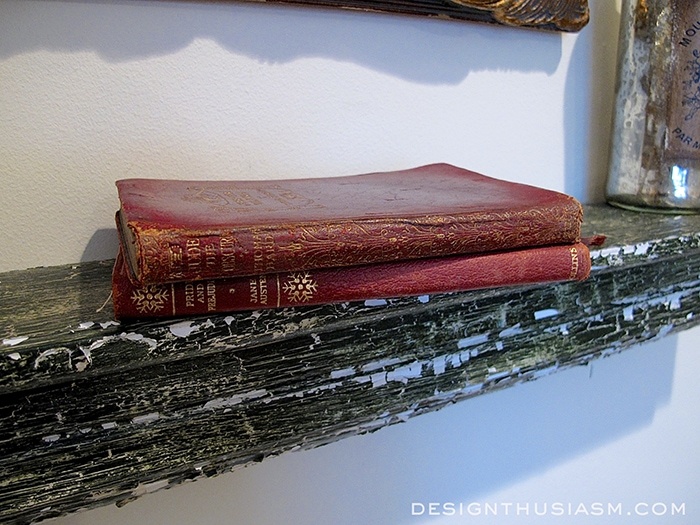 In keeping with that theme, the shelf displays a few vintage leather bound books. Flanking the mirror are two tiny watercolors that I picked up in San Gimignano in Tuscany, Italy. You can catch a peek at the subtle floral on the comforter, a favorite pattern of mine that works beautifully with menswear tweeds. If my son was living here I’d likely consider it too feminine, but as his guest quarters, it’s actually just fine. 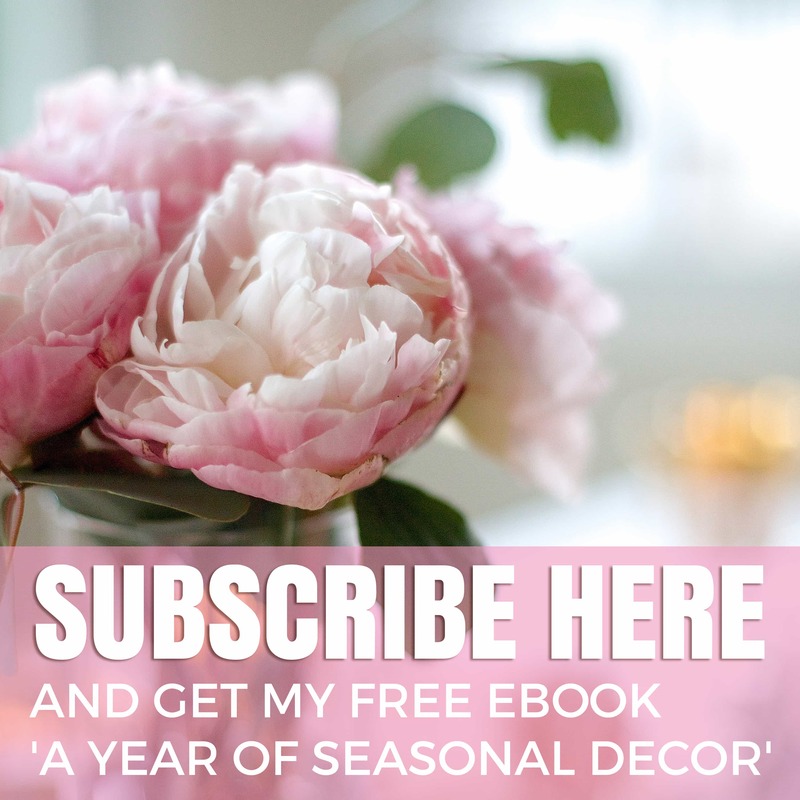 (It’s far less feminine than the floral my hubby sleeps under!) When then room is complete I’ll reveal the rest of the bedding which highlights a grouping of more masculine patterns. You can see the planning for this room in my earlier post, Mixing Patterns for a Sophisticated Look. Once complete, it will be fun to see how close I stayed to the original plan. So what do you think about painting the chair? I know people have very strong opinions about painting wood. Where do you stand on that and do you think it would work well for this particular piece? 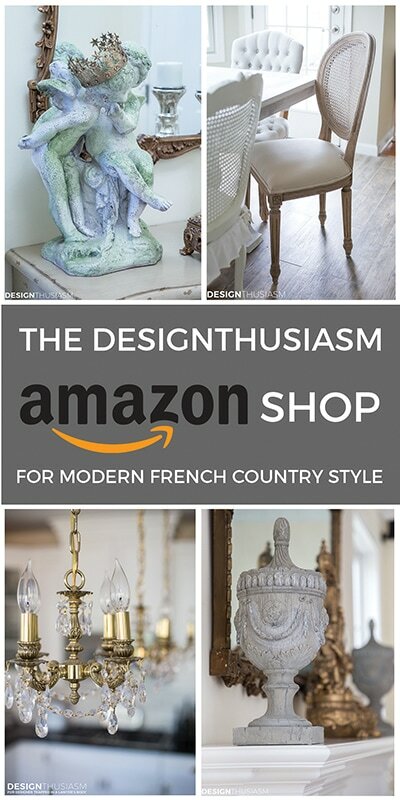 I’ve been looking for a project to begin refinishing furniture. Is this the one? That’s gorgeous, Lory. 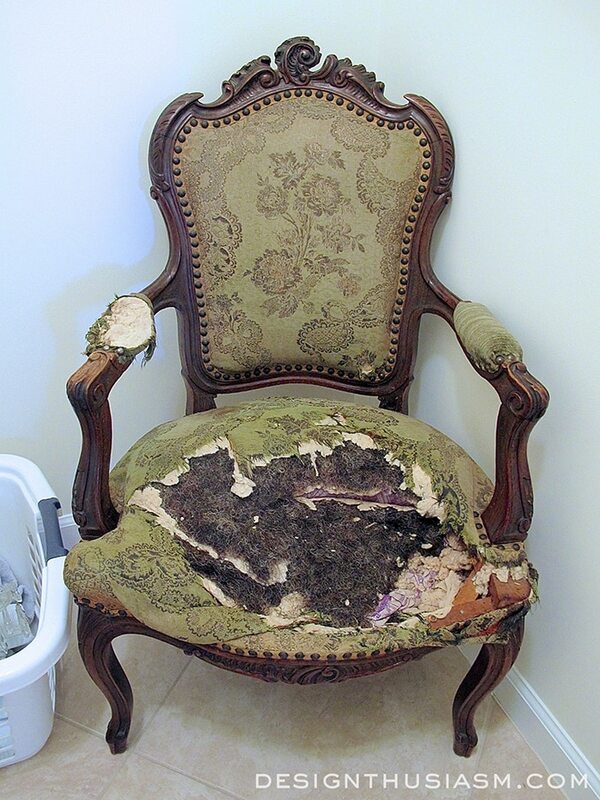 I need to find an upholsterer around here to transform a chair, too. I love the textured neutral fabric you chose and the nailheads. I love the chair, and the liitle peek at the room. The wood appears to be in good condition, so I would hold off painting it until that changes. The chair is elegant as it is. Having said that, I think gold leaf rubbed into the design similar to the mirror frame would also be gorgeous. Thanks, Kim! I think one of the things that held me off was that I didn’t have an upholsterer that I was familiar with, but I just bit the bullet and picked one nearby… 🙂 Now I have a few more pieces in the basement I may re-look at. I would not paint the chair. I think the fabric and the nailheads give it a stunning look, and set off the wood beautifully. I think painting it would take away from the charm that it has now. I think of the craftsman who carved that beautiful wood and brought a tree to life. Painting furniture is overdone, it’s like taking the nature beauty from a fine piece of jewelry. I have painted what I call curbside furniture that could not be savaged in any other way. Love the room where the chair holds court! I have no problem with painted furniture and have painted several pieces myself. However, in this case I love the chair as it is now. 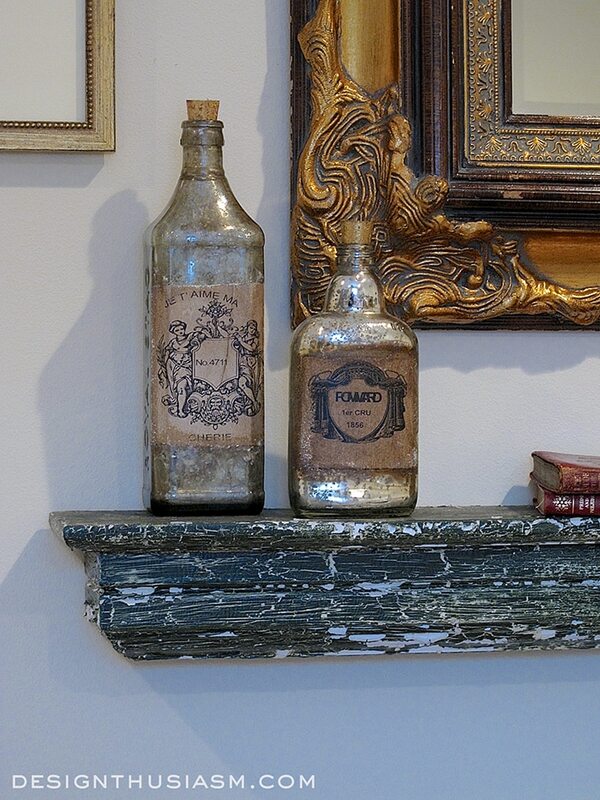 It is so elegant looking, the wood has a wonderful patina and it looks to be in fantastic shape. At any rate, I’m so happy you rescued and restore it. It’s lovely. 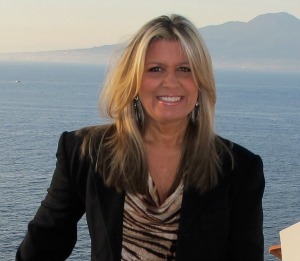 Thanks so much, Jeannie! Yes, I think I’ll live with it for a while. What’s really motivating me towards painting, though, is that I think all the highs and lows and nooks and crannies lend themselves perfectly to an interesting paint technique. But I’m definitely not ready for it. Look how long it took me to even re-upholster it! 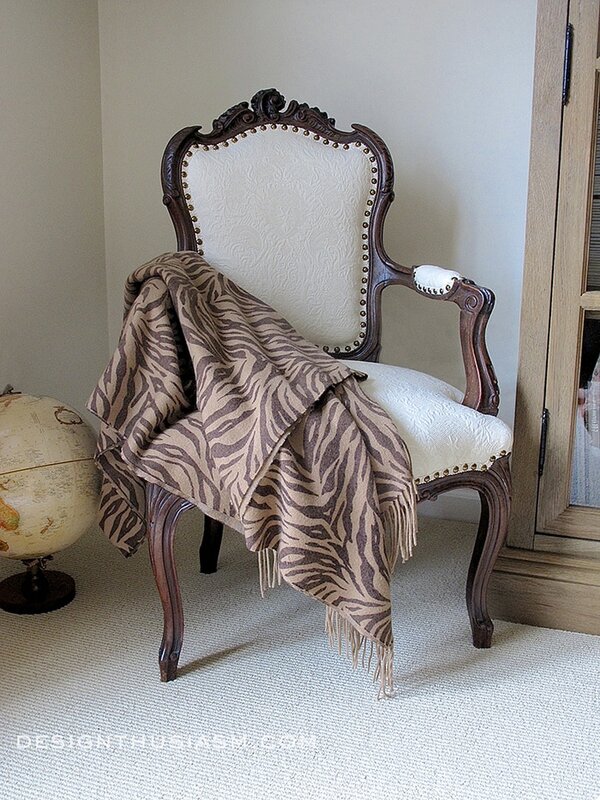 The chair is beautiful and I love the contrast of the dark wood with the very light fabric. It’s a stunning piece! Thank you very much, Kathy! I also love whites and creams against dark wood… 🙂 Thanks for visiting! It is beautiful!!! Leave it alone as it is the perfect finish as is!!! Thanks, Jeanie! At the very least I will enjoy it as is for a while, if not for good… 😉 Once I complete the room I’ll share it here again. Thanks for stopping by!! Ha ha, you’re not disagreeing with me… 😉 I probably lean towards the painting camp, although I can enjoy it both ways. I like a mix of finishes in a room and this room already has a lot of dark wood. I also think the carving and crevices would lend well to an interesting paint technique. I do think I will live with it for a while until I completely decide. Thanks for visiting and taking the time to comment!! Thank you so much, Vicki! (I love the pleasant way you share your opinion, btw… ;-)) And you’re so lucky about the snow! Can’t wait until ours is gone. Thanks for stopping by!! I have a chair fetish so of course I love it! The frame is gorgeous, and so is the fabric, a beautiful marriage. I like the dark wood. I wouldn’t change it. It goes well with your decor. Wow, what a beautiful makeover. 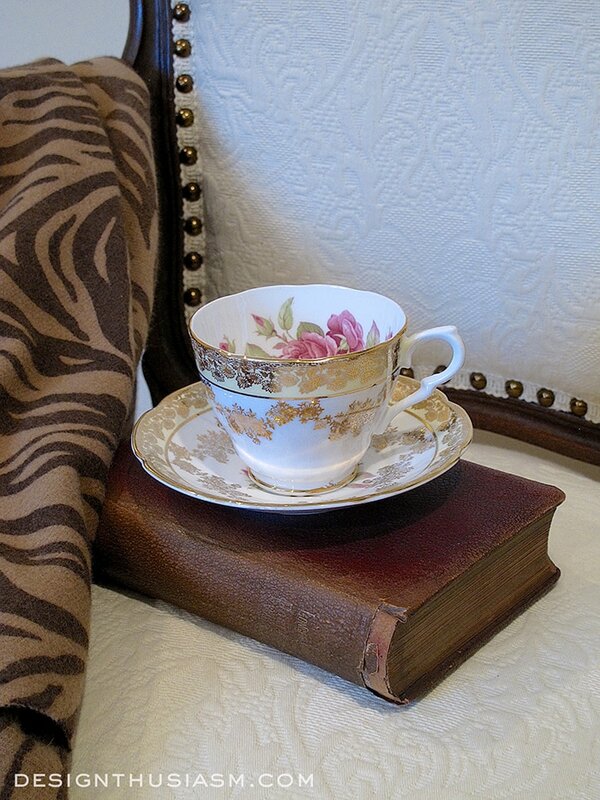 You’re right, the gorgeous fabric is stunning with the dark wood! 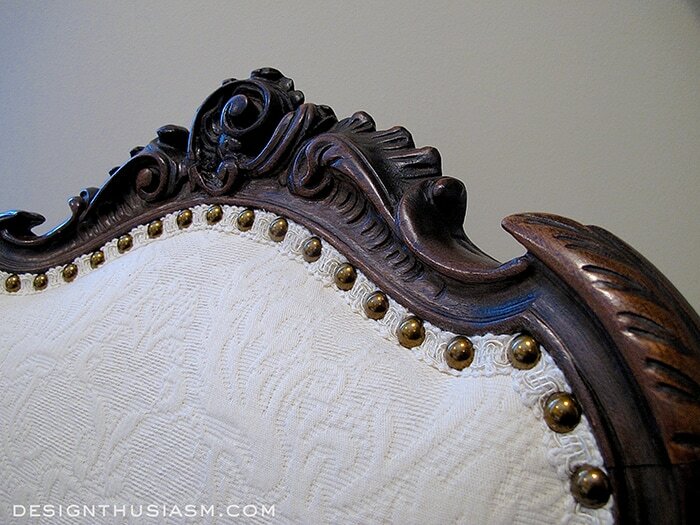 I like how he added nail heads over the gimp upholstery ribbon for added detail. 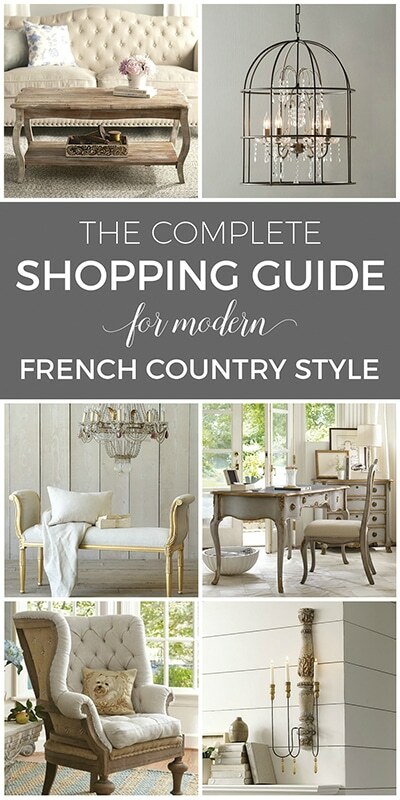 I am addicted to French Chairs and your chair is beautiful indeed! It is beautifully upholstered! I hope you enjoy a great weekend! I love the dark wood on your chair!!! If it were lighter wood, I’d say go for it and paint it!!! the darker wood tone will give the room a more gender friendly appearance!!! I’ll be watching for a reveal!!! Thanks, Pat! I think I might agree. Because of the curves and recesses in the piece, I think it would be a natural for paint, but given the room setting, I may just leave it. Can always change it later… 😉 Thanks for following along!! It’s a beauty now! Love the end result. I LOVE the contrast between the dark wood and the upholstery. It’s gorgeous! 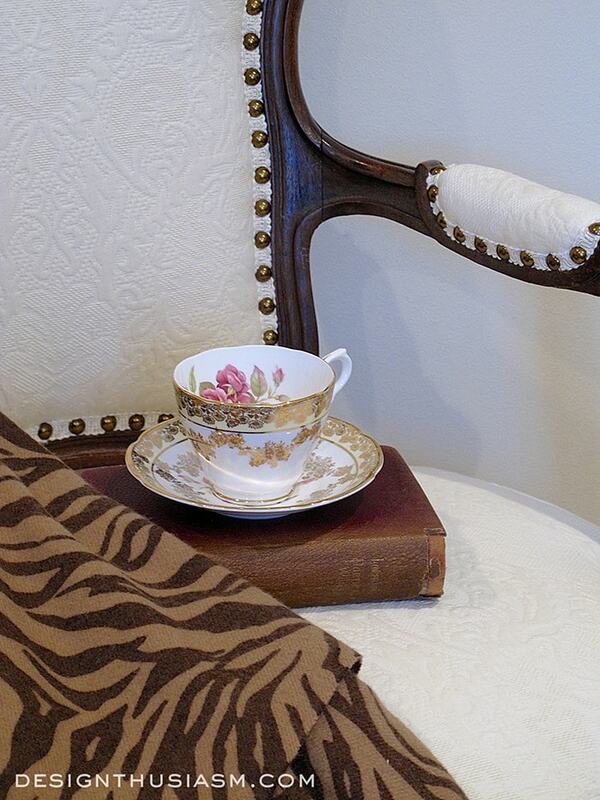 I have gilded a couple chairs and have natural linen fabric and love the look ! 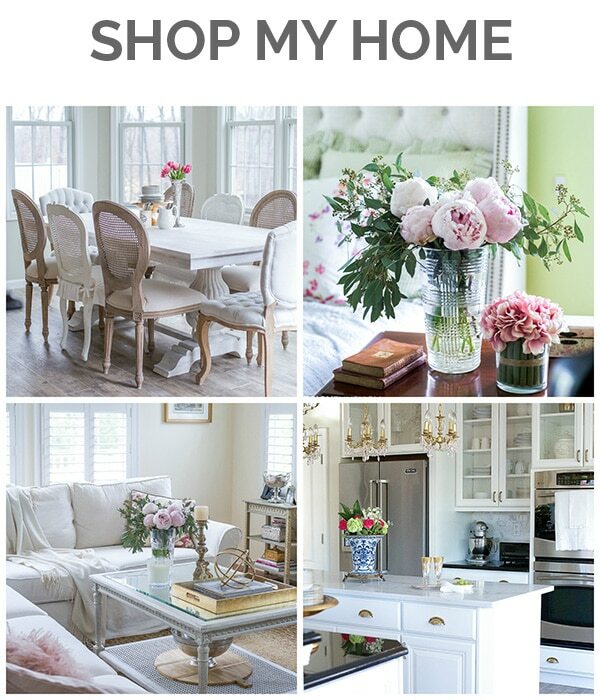 But, it looks pretty now—I’d live with it for awhile and you may see something on Pinterest that catches your eye ! Gorgeous! 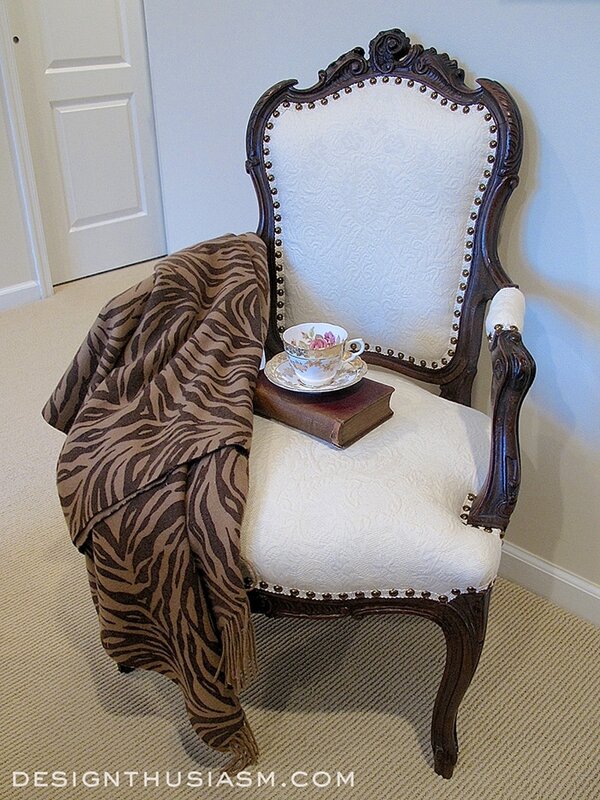 Beautiful chair and the fabric is perfect…lovely! It’s great when you can see the potential in something. 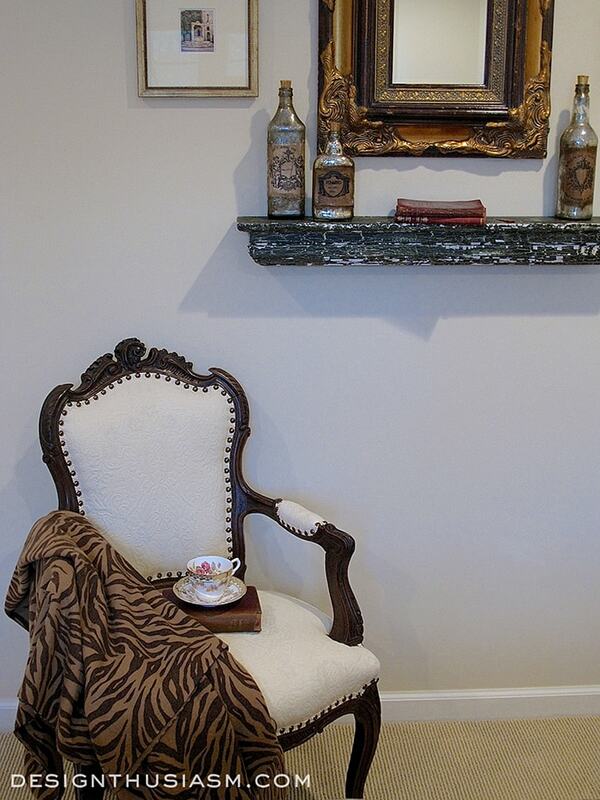 You have done an absolutely fabulous job with this chair, you have turned it into a beautiful timeless classic. Thank you so much, Sam! I don’t know what took me so long, but I’m glad I finally did it… 🙂 Thanks for visiting!! I love just the way it turned out. Often , we overdo it with the paint. Then it becomes too busy for our rooms. I would keep it just as is! Nice job! Thanks so much, Pam! I would probably love it both ways, but since it’s already done with the dark wood and looks lovely with the white, I will likely keep it that way… 🙂 Thanks for stopping by and leaving a comment!! Your chair is gorgeous! and I’m so glad I found this post. 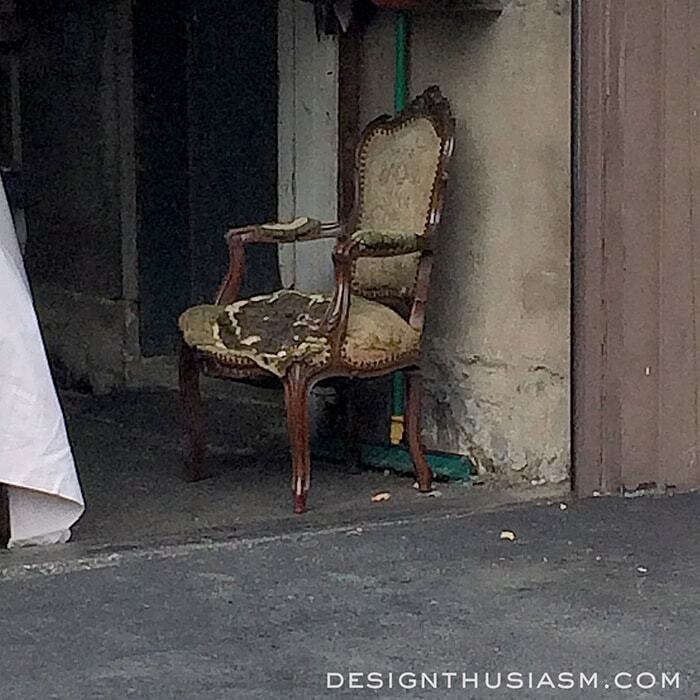 I will soon be dropping off my two old, but not antique, very dark wood little French chairs at the upholsterer’s with very light (bisque) matelasse fabric, similar to yours. I’ve been second guessing myself about the fabric being too light for the dark wood and that the aged brass nailheads would stand out too much until I read this post. You’ve made me a LOT calmer. I will also add that I LOVE florals with menswear fabrics.